An award winning Roman archaeologist and numismatist. Anne Robertson's reputation in the two areas of academic study - archaeology and numismatics - was achieved while also maintaining high standards of museum curatorship and public engagement. Anne Strachan Robertson was a graduate of the University and titular Professor of Roman Archaeology from 1974 until her retirement in 1975. 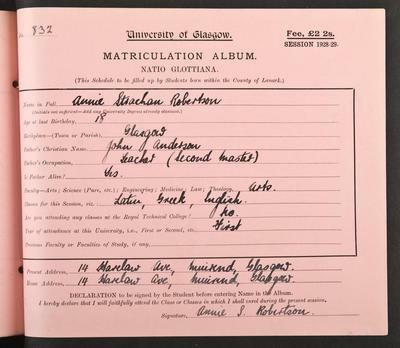 A former pupil of Glasgow High School for Girls, Robertson graduated from the University with a first in Classics in 1932. She continued her studies at the University of London and returned to Glasgow in 1936 as Dalrymple Lecturer in Archaeology. She was subsequently appointed Keeper of the Cultural Collections and of the Hunter Coin Cabinet at the Hunterian Museum. 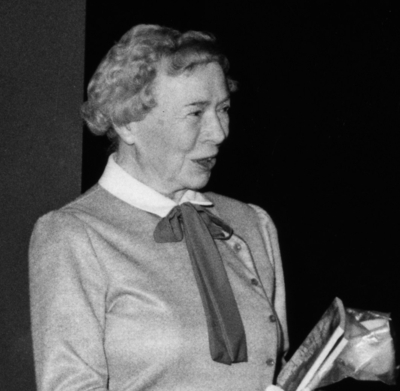 In 1963, she was appointed Senior Lecturer in Roman Archaeology, becoming Reader the following year. Robertson was an authority on the Roman archaeology of Scotland and a respected numismatist. Among her publications, The Antonine Wall (1960) was reprinted five times and the catalogues entitled Roman Imperial Coins in the Hunter Coin Cabinet (1962 and 1971) were praised as models of clarity and accuracy. She was a stalwart of the Glasgow Archaeological Society and Secretary of the Scottish Field School of Archaeology from 1948 to 1973.